.". In a slightly earlier edition of White's (1857) the number of establishments was given as three. Nevertheless, by 1862 several hydros had opened and others were about to open, including establishments run by two of Ralph's brothers, Thomas and George Davis. Mr. Davis was one of seven children born to William and Hannah (née Botham). He was baptised at St. Giles', initially following in his father's footsteps by becoming a framework knitter. In 1837 Ralph married his first wife, Lydia Wright, although Lydia unfortunately died the same year. He later married Ann Buckley (née Alton) on 25 Feb 1850 at Duffield. Some of Ann's daughters helped in the family business and Harriett, and her second husband, George Richards, took over the business for a time when her parents became elderly. 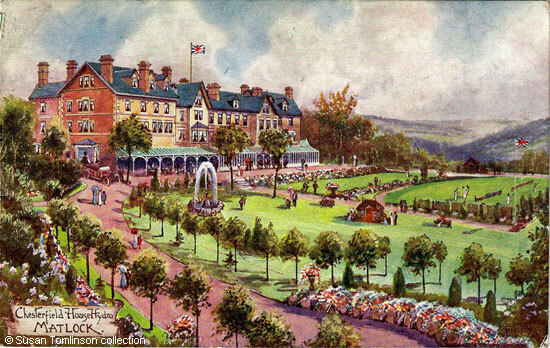 At a dinner to celebrate Mrs. Davis's 85th birthday on Saturday 19th May 1894 a gentleman called Joseph Waddington declared that Mr. and Mrs. Davis were the real pioneers of hydropathic treatment in Matlock. They had started the first establishment for the water cure on the site of Smedley's hydro some 43 years previously. When John Smedley bought them out they continued to manage the new concern for a time before moving on. Ralph Davis's next venture, before he opened Chesterfield House in 1861, was Southview Cottage, which survives as the original part of what was later the Smedley Memorial Hospital. He then went on to build, own and operate Chesterfield House Hydro on Chesterfield Road which is the subject of these three postcards. 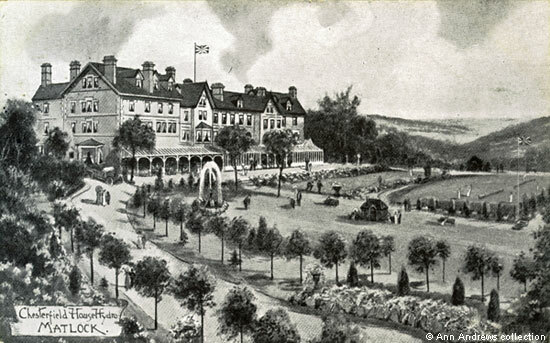 Chesterfield House had extensive grounds and an advertisement placed by the manager, J. Wall, in 1899 stated that "This house is most pleasantly situated in its own grounds and commands the finest views in the district; southerly aspect; good table; special terms for weekend". "Derbyshire Advertiser and Journal", 12 October 1855.
his Wife. Board, Lodging, and Baths, 2s. per day. Ralph and Ann Davis died just over a year apart, with Ann being buried at St. Giles' on 28 Feb 1895, aged 86, and Ralph on 13 Oct 1896, aged 81. In February 1898 the Chesterfield House Hydro (Limited) Company Ltd was been formed, with capital of £20,000. The property was valued at over £15,600. The first two directors were Mr. J. H. Wall and Mr. J. A. Wall, Ralph Davis's two grandsons, and the company's solicitor was Mr. E. Stanley Aulton of Matlock Bridge. In 1901 George F. Walton, a secretary, was the name at the top of the list of residents. By 1911 the hydro had 39 rooms; Arthur Albert Hitching and his wife Sarah Maria were the hydro's managers with John Kay, later to run Lilybank, on their staff. They had been at Chesterfield House since 1906. Chesterfield House remained open at the beginning of the First World War. The house was used as a convalescent home for soldiers from 1917 to 1920-21 and Mrs. Margaret Sutherns was the Managing Director from 1917 (see next page). The last reference to it being used as a hydro or for convalescing was in 1924. By September 1926, when the Ancient Order of Foresters considered running Chesterfield House as a possible convalescent home, the former hydro was for sale. The top image of Chesterfield House dates from the early years of the twentieth century. Rather charmingly, whilst two couples are playing tennis and others are [perhaps] taking tea on the verandah, a few sheep are grazing in the enclosed area in the foreground. Whilst this card was posted in 1911 another, published in David Barton's book, was posted in 1907. Below are two more pictures of the hydro, one black and white and the other coloured, which also must be pre-war that show Chesterfield House after it had been enlarged. The hydro was enlarged and the grounds landscaped. had not been built in 1907. Like most of the other local hydros, Chesterfield House provided training facilities for football teams. Before a replay between Derby County and Northampton in 1909, both teams enjoyed Matlock's facilities with Northampton at Chesterfield House and Derby County only a short distance away at Oldham House. The teams even travelled on the same train! The hydro's Christmas festivities at the end of 1909 were said to have been on a lavish scale, with the house being full to overflowing. The staff held a Christmas banquet for their guests and they also put on a couple of concerts, there was a billiard tournament, a whist drive, a skittles match and a fancy dress ball. The celebrations continued until the New Year. Presumably their guests went home happy. The Davis family were long livers. Their daughter Harriet died in 1938, aged 93. She had married Josiah Wall at St Giles on 17 Jan 1865 when she was 19 and then had two more husbands, George Richards and John J. Palliser whom she married in 1914. She outlived them all. For some years before her death Harriet Palliser had lived with her daughter, Mrs. Fred Priest, who was the widow the of the former Hartlepools United Manager and Sheffield United player. She was said to have been a remarkable old lady. She recalled that when she was young the Derby-Manchester stage coach would swing into Matlock, with its load of passengers and mail. When she was 90 she was interviewed by a local paper and she recalled her first ride in a train, the coaches then being the same as the present day (i.e. 1938) cattle trucks. A coloured version of the second card. 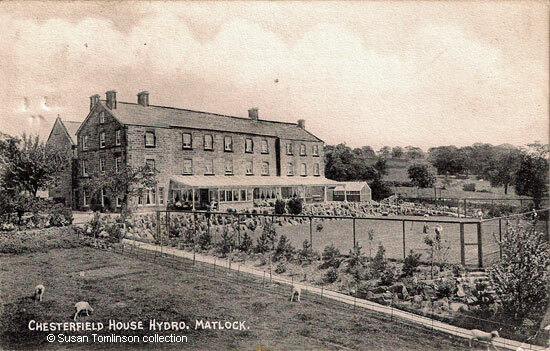 When Mother Xavier Murphy visited Matlock about 1926 the once busy hydropathic establishment founded by Ralph Davis was closed and the building unoccupied. The Presentation Sisters, who were based in India, decided to buy Chesterfield House, opening their Convent in 1927 and the school was opened shortly afterwards. The senior school has closed but the convent continues and Chesterfield House is a residential care home. 1. Chesterfield House Hydro, Matlock". No publisher. Posted in Matlock on 10 June 1911. © Susan Tomlinson collection. 2. "Chesterfield House Hydro, Matlock". No publisher. Card posted in Matlock on 17 Sep 1918. © Ann Andrews collection. 3. "Chesterfield House Hydro, Matlock". Coloured version of image 2. Published by A. Burkhart & Co., London. Posted at Mansfield on 4 Jul 1914. © Susan Tomlinson collection. An advertisement in "The Sheffield & Rotherham Independent", on 6 April, 1896 says Ralph Davis established his business in 1852. John Smedley bought his Matlock property in the Spring of 1853 ("The Derby Mercury", 27 April, 1853). General Commercial Directory and Topography of the Borough of Sheffield with all the Towns, Parishes, Villages and Hamlets Within a Circuit of Twenty Miles, pub. Francis White & Co. Sheffield (1862). William Davis married Hannah Botham in 1803 - see Matlock marriages. Ralph's marriage to Lydia Wright on 27 Feb 1837 is also listed. Baptisms for St. Giles' are on elsewhere this website. Ralph was baptised there 19 Mar 1815. Lydia Davis was buried at St. Giles on 07 Nov 1837 - see transcript of her burial. "Derbyshire Advertiser and Journal", 25 May 1894. Information from Ray Ash. Ralph Davis was the brother of Ray's 3 X great grandmother. Ralph Davis is show on Matlock Bank on Matlock & Matlock Bath Public Notices & Announcements, 1855 and later, in 1867, when he was on Chesterfield Road. There were many advertisements placed in the press in the late 1890s. This quote is from: "Derbyshire Advertiser and Journal", 24 June 1899 (Chesterfield House Hydro). "Derbyshire Times", 19 February 1898. Kelly's 1899 Directory also shows it had become a limited company. Mr. and Mrs. Hitching were at Chesterfield House in the 1911 census (available on Find My Past). The Hitchings were also shown in Kelly's 1912 directory | Kelly's 1916 directory. They are known to have left in 1917 as an obituary for Arthur Hitching states "he came to Bristol in 1917" ("Western Daily Press", 27 July 1942). "Derby Daily Telegraph", 27 September 1926. "Derby Daily Telegraph", 18 January 1909. "Derbyshire Courier", 4 January 1910. A Feast of Fun. Xmas at Chesterfield House, Matlock. The Fancy Dress Ball. "Derby Daily Telegraph", 22 February 1937. "Derby Daily Telegraph", 4 February 1938. Matlock Lady's Death. Mrs. Palliser's Early Days. Schools: short descriptions of Matlock Schools, including the Presentation Convent.